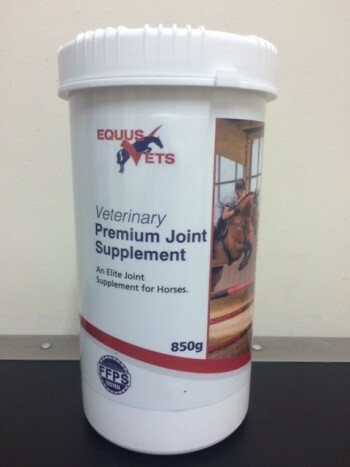 Our Equus Vets Premium Joint Supplement is a complementary feedstuff for the nutritional maintenance of healthy cartilage in the joints of older horses or horses in training or competition work. Joints between the junctions of bones are lined with cartilage and filled with synovial fluid. The cartilage lining acts as a protective layer, shock absorber and allows the bones to slide over each other. As horses get older or due to direct trauma the cartilage lining can become damaged. As the damage increases the bone beneath the cartilage pad becomes affected as well, this is known as DJD or arthritis. This can lead to new bone formation (osetophytes) around the joint. The clinical signs can begin with ‘not being quite right’ to stiffness, inflamed joints, reduced flexion to permanent lameness. The key to treating DJD is to try and prevent the fire from starting rather than having to put it out. One of the easiest ways is to feed an oral joint supplement. The main ingredients in these are glucosamine, chondroitin sulphate, hyaluronic acid and methylsulfonylmethane (msm). These ingredients are naturally found in the body and helps synthesis the production of cartilage and reduce inflammation. Cartilage is an unsual tissue in that it has few cells (building blocks) within its make-up and therefore repair can be self-limiting. Supplementing a horses diet with these key ingredients can maintain and assist in the production of cartilage. As vets we are frequently asked, which one do you recommend? As there are so many available. The main question is ‘Does it contain what it says on the can?’ A recent study looked at the actual glucosamine content of 23 equine oral joint supplements and found a range of glucosamine content of 0% to 221% of label claims. Nearly 40% (9/23) contained less than was claimed and 4 was less than 30% of the label claim. Therefore, we have produced are own, Premium Joint Supplement. It contains Chondrotin Sulphate, Glucosamine HCL (99% pure) MSM and Boswellia Serrata. It contains what it says on the label! Ponies up to 300kg 1 scoop daily. Horses up to and over 500kg 2 scoops daily. Ponies up to 300kg half a scoop daily. Horses up to and over 500kg 1 scoop daily. Equus Vets Premium Joint Supplement is competition legal. "Jon Herrod-Taylor has been my vet for the past 24 years, and has exceeded my expectations. During that time he has dealt with over a hundred horses, from stud work and castration, to some horrendous injuries ... [see more]"
When buying a horse, we always advise that you have any potential purchases thoroughly evaluated by a vet. We offer pre-purchase examinations (vettings) to both existing and external clients, with simple packages and no hidden charges.